It's a Frightful miracle! Yes, today's post is actually on a Friday. It's been a while since this feature has gone to the sea, and today's monster does so in a big way. The dread kraken-spawned oceanic hydra rampages across the sea, smashing ships and devouring sailors, and it enjoys protection from fire that would otherwise severely hinder it. I hope you enjoy the oceanic hydra, and I'll be back next week with another monster. Thank you for reading! PS: Don't forget the Here Be Monsters 2 contest going on now. This post has all the details you need to enter your monster. I'm hoping to see a lot of great entries! You can find this impressive creature here. Four crested serpentine heads are barely visible through a shroud of mist. The creature towers over maritime vessels. Aquatic Shell (Su) A constantly flowing shroud of water surrounds an oceanic hydra. This aura douses all nonmagical fires in the area and inflicts a –4 on ranged attack rolls. Additionally, the hydra gains concealment (20% miss chance) against all attacks made from more than 5 feet away. If a creature with the fire subtype ends its turn adjacent to the hydra, it takes 25d6 points of damage (DC 29 Reflex save for half). Finally, the shell dispels any fire spells targeting or including the hydra in their area, but the hydra must succeed on a dispel check (1d20 + the hydra’s HD) against the spell (DC 11 + caster level of the fire spell). If a hydra succeeds at dispelling a spell with an area of effect, it only dispels the portion covering the hydra’s space. If an oceanic hydra takes at least 50 points of fire damage from a single source, it loses the benefit of its shell. If it is in a body of water, it can use a standard action to restore the shell. Breath Weapon (Su) In addition to the damage dealt by an oceanic hydra’s breath weapon, the hydra also gains a free awesome blow combat maneuver against all creatures taking damage (creatures succeeding at their Reflex saves add 8 to their CMD). Hydra Traits (Ex) An oceanic hydra can be killed by severing all of its heads or slaying its body. Any attack that is not an attempt to sever a head affects the body, including area attacks or attacks that cause piercing or bludgeoning damage. To sever a head, an opponent must make a sunder attempt with a slashing weapon targeting a head. A head is considered a separate weapon with hardness 0 and hit points equal to the hydra's HD. To sever a head, an opponent must inflict enough damage to reduce the head's hit points to 0 or less. Severing a head deals damage to the hydra's body equal to the hydra's current HD. A hydra can't attack with a severed head, but takes no other penalties. Regenerate Head (Ex) When an oceanic hydra's head is destroyed, two heads regrow in 1d4 rounds. A hydra cannot have more than twice its original number of heads at any one time. To prevent new heads from growing, at least 10 points of fire damage must be dealt to the stump (a touch attack to hit) before they appear. Fire damage from area attacks can affect stumps and the body simultaneously. A hydra doesn't die from losing its heads until all are cut off and the stumps seared by fire. 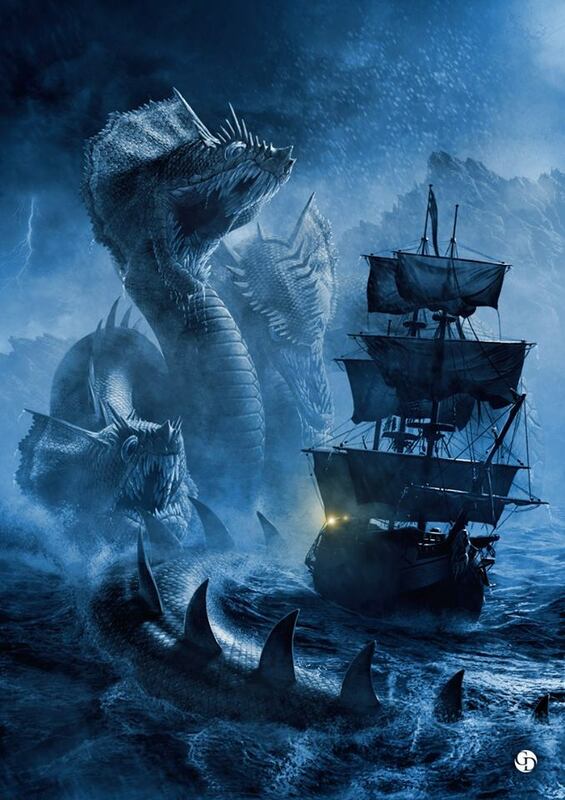 Ship Killer (Ex) An oceanic hydra ignores 5 points of hardness with all of its attacks. Dread krakens took terrestrial hydras for their regenerative abilities and grafted on several abilities to create marine engines of destruction. The resulting oceanic hydras are slightly more intelligent than their land-bound progenitors and only start off with four heads. Where they truly shine is in their devastating abilities. They breathe a torrent of seawater that pushes foes away, and they have a protective watery shell that proves antithetical to fiery creatures and effects. Oceanic hydras prefer to open their attacks by breaching the hulls of ships and attacking those fleeing from the sinking vessels. As with many dread kraken creations, these hydras owe no fealty to their creators, but the krakens are content to allow the hydras to rampage on the surface while they remain safe on the ocean floor. Here Be Monsters 2 is ramping up, and I'm one of the judges this year! I'm in amazing company with Mikko Kallio and Jacob W. Michaels, both of whom run the blog A Sword for Hire, which is hosting the contest. The inimitable Adam Daigle is guest judging. Check out the blog for more details. The monster requirements will be released soon. I hope you consider entering, and I look forward to reading your entries. Hello, and welcome back to the second of this week's monsters. I'm zeroing in on Friday, and I anticipate actually posting a monster on the upcoming Friday. Today's monster comes from a picture on my friend Patrick's Facebook page, and an able assist by Drejk brought it to my attention. The post made reference to a devil dog, but I wanted something less evil this time (you know, for a change of pace), and the bookshelves behind the dog swerved me to the idea of a canine protector of arcane lore. I hope you enjoy the athenaeum sentinel, and I should (really!) be back on Friday with a new monster. Thanks for reading! No tomes for you! Rowf! 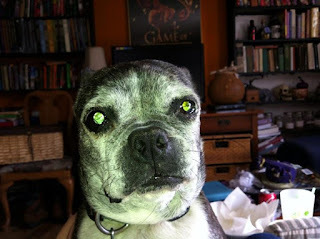 This otherwise unassuming dog’s eyes glow green, as if they could pierce through to a creature’s very soul. Blast Sanctum (Su) If an athenaeum sentinel is caught within the area of a damaging spell or spell-like ability and the caster fails to penetrate the sentinel's SR, the effect is negated as if countered. Final Word (Su) When an athenaeum sentinel dies, it affects all creatures within 40 feet as if targeted with the sentinel’s choice of dictum, holy word, or power word stun (CL 13th, save DC 21). If the sentinel chooses power word stun, the effect cannot exceed 150 total hit points and stuns creatures with the fewest hit points first. Know Alignment (Su) An athenaeum sentinel automatically knows the alignment of any creature it can see. Athenaeum sentinels were bred by mages who valued the dogs’ loyalty and infused them with magical abilities that allow them to drive off intruders and protect the repositories they protect from harm. Sentinels prefer to convince trespassers to leave peacefully, but they prepare for mayhem from chaotic or evil creatures. Their partners—the highly intelligent athenaeum sentinels do not regard them as “masters”—receive a warning akin to the alarm spell when athenaeum sentinels confront intruders and when they die. Unless the sentinels wish to inflict maximum damage to evil or chaotic opponents upon their deaths, they usually resort to power word stun on dying to hold their foes long enough for their partners to arrive and mete out whatever justice they wish to. Because athenaeum sentinels spend much of their time around books and other documents, they have inherently absorbed considerable knowledge. While protecting their libraries, they use this knowledge to determine the best choice for their invader bane ability. Gaining a sentinel’s trust, especially convincing it that no harm will come to its protected materials, allows characters to ask it questions, for which it will provide answers to the best of its ability. Athenaeum sentinels released from duty find adventurers with whom they can share their wealth of knowledge and for whom they can act as protectors. Hello, and welcome back to a new edition of Frightful Fridays! I meant for this to go out on Friday, but life intervened, so here it is not even remotely close to Friday. My friend Patrick brought the artwork for this to my attention (and the alternate name of the Nope Crawler),. Since I can't say not to creepy spider-like monsters, I created the skittercorpse, which likes to pretend to be the body of a friend or family member to draw its meals close. This vaguely recognizable corpse sprouts spear-like legs. A hungry maw opens at the top of its head. Ability Drain (Su) When a skittercorpse establishes or maintains a grapple with its bite, it deals 1d4 Strength drain and 1d4 Wisdom drain. A creature reaching 0 in either ability score dies as a result. Create Spawn (Su) A creature that dies while a skittercorpse has grappled it returns as a skittercorpse 24 hours later. The new creature is independent of the skittercorpse that created it. Dearly Departed (Su) A skittercorpse can scan the thoughts of creatures in range of its lifesense and takes on the appearance of dead humanoids with strong connections to the scanned creatures. If a target creature fails a DC 21 Will save, it becomes shaken when it sees the skittercorpse. This is a mind-affecting fear effect. The save DC is Charisma-based. Horrific Transformation (Su) When a skittercorpse assumes its true form, all creatures within 120 feet of the skittercorpse must attempt a DC 21 Will save. Failure causes the victim to become frightened for 1d4 rounds. A creature affected by the skittercorpse’s dearly departed ability incurs a –4 penalty on the save and is frightened for 2d4 rounds on a failed save or 1 round on a successful save. This is a mind-affecting fear effect. The save DC is Charisma-Based. Impalement (Ex) When a skittercorpse confirms a critical hit with a claw, it can make a grapple attempt as an immediate action. A success gives its opponent the pinned condition. Lockjaw (Ex) A skittercorpse has a +4 racial bonus to grapple checks it attempts with its bite. Skittercorpses use deception to lure the living to them, whereupon they change into their hideous forms and latch onto their unsuspecting victims. Given their ability to read the thoughts of those who come near them and their limited capability to assume different forms, scholars assume that skittercorpses are the reanimated remains of vengeful doppelgangers. Other theories suggest they arise from the bodies of people left behind to die by their companions, and their resentment drives them to lure the living to a horrifying doom. Skittercorpses prefer to use their thought-reading ability to create the appearance of a single individual common to all their victims to improve the deception, but they usually manage to trick at least one creature into approaching their inert forms. If no one approaches and does not attack, the corpses exert enough patience to wait for the next set of victims. Skittercorpses lair in places where corpses are commonly found, such as well-traveled dungeons or graveyards. Skittercorpses attract will-o’-wisps to their lairs, as the latter creatures feast on the overwhelming fear generated by the former creatures. In return, will-o’-wisps act as candles or other sources of light to add to the ruse of an ordinary corpse.